We have a diverse range of 8ft round trampolines which are all on sale and from well-known trampoline brands. No matter how big or small your garden is, our 8ft round trampolines can fit in any size garden. All of our trampolines displayed on this page have safety enclosures, this is because we want to make sure that your children can play safely on our 8ft round trampolines. We believe that children and young adults should be healthy and active, which is why we promote ‘Exercise through Play'. Our 8ft round trampolines are a great way for you children to stay active, healthy and happy. Our 8ft round trampoline are unique in the own way, for example, we have 8ft round trampolines that come with a free ladder, cover or tent. Whereas others are from the UK's leading trampoline brands which include Vortex, Telstar, Cortez, Plum and much more. You're spoilt for choice with our deluxe range of 8ft round trampolines. All of our 8ft round trampolines are on a big sale, you can save up to £140 when buying a trampoline from us. So have a browse at our fantastic range of 8ft round trampolines. Click on the following links to see some more of our other trampolines such as our 10ft round trampolines or our 14ft round trampolines. Here at Trampolines Online, we have a great passion for trampolines and we believe that our quality range of 8ft round trampolines are ideal for you and your children to have for any occasion. 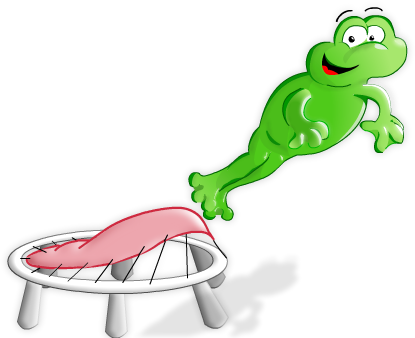 If you would like to buy an 8ft round trampoline today, contact us via telephone or by email and one of our friendly team members will get back to you as soon as possible. As Trampolines Online are one of the best suppliers of trampolines for sale.